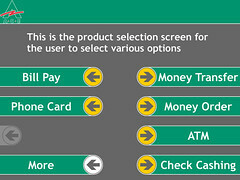 Ace Cash Express offers check cashing, money order, money transfer, and bill payment services primarily to the “unbanked” (people without bank accounts). These services are provided through traditional stores and self-service kiosks. The kiosks operate on legacy ATM hardware and software dating back 10-20 years. I served as an Interaction Design Consultant responsible for redesigning the interface for these kiosks. I segregated the screens into a set of seven templates consisting of the attract sequence, product selection, data entry, informational display, transaction processing, hardware device interaction, and decline/error. I designed instructional animations that showed the location of hardware devices (card reader, check reader, camera, check dispenser, printer, and phone) and operating instructions. I also developed branding scenarios including full brand presentation, co-branding flexibility, ingredient branding, and a generic unbranded option for on-screen display.